The mantra to effective learning! Why must learning be Fun? For learning to be effective, it needs to be driven by student’s pull to learn, rather than the teacher push or parent coercion. Education is too often seen as the transmission of knowledge. Real learning happens when students feel the need to learn. This pull or need will be generated if we enjoy the learning process. It is true for any stream and field, not just Math. Think about learning to drive a car or playing guitar. 1.When one just starts playing guitar, every thing is really tough. Just holding the guitar properly is a chore. It takes efforts and a lot of practice, just to put the hands on the proper strings. Leave alone playing good music. Now think of 2 different scenarios. One, when you don’t want to learn but are being pushed to do so. Second, when you actually want to learn yourself. Needless to say, in the second case, you will practice more, the teaching will be more effective and you will take more interest. 2. Since you want to learn and you enjoy the learning process, the practice will not seem like an effort. As you practice more, you get better at playing. That too, at a much faster pace than other students, who have started learning at the same time as you. All this, because you were interested to learn. The same is true for Math. 3. As you get better at playing guitar, you enjoy playing it even more. 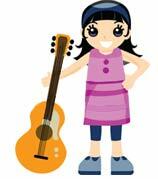 Now, holding the guitar or finding strings comes intuitively to you. 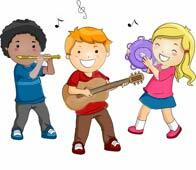 You now spend your time and energy in learning new tunes.So, while others are still trying to figure out how to hold the guitar, you are creating new songs. You begin to get joy out of listing to your own music. 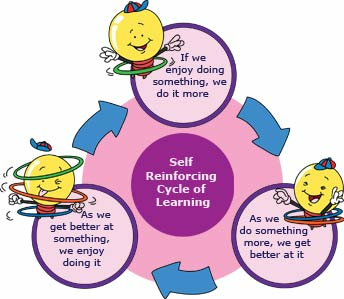 At SchoolCountry, we firmly believe in the power of self reinforcing learning cycle. So, to teach Math to students, we make sure that they enjoy learning it. That, there is a pull to learn instead of the push. The outcome, Math that students love and results that parents are proud of. Read more >> 5 concrete ways how you can make learning fun.